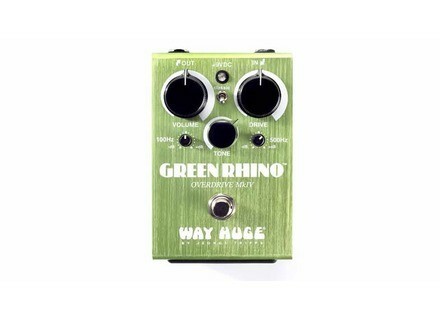 WHE207 Green Rhino Overdrive MKIV, Overdrive pedal from Way Huge Electronics. Way Huge Electronics has introduced the latest evolution of their Green Rhino Overdrive: this one has a smaller housing and extra control. 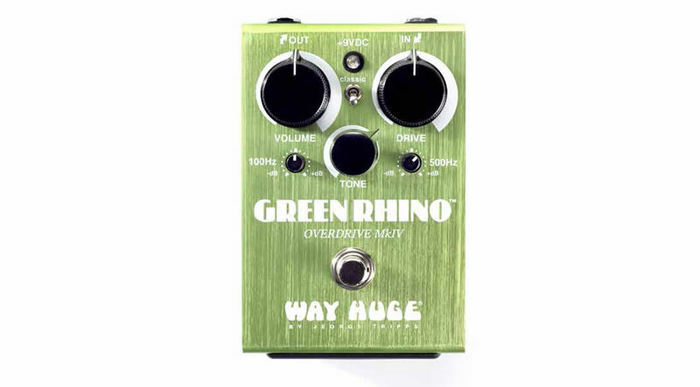 While the Green Rhino Overdrive Mark IV is smaller and more compact than its predecessors, it features a new 500Hz control (so as to to cut or boost your lows and mids by 12dB each way) in addition to the original's Volume, Tone, and Drive knobs and the 100Hz control inherited from the Mark II version. And just in case you miss the original, MkI's sound, a Classic switch disconnects all new features and leaves you with just the familiar Volume, Tone and Drive of the original Green Rhino Overdrive. [NAMM] Dunlop DVP4 Volume (X) Mini Pedal Dunlop keeps miniaturizing its pedals, and this time it's the DVP3 Volume (X) that gets adapted into the (somehow counterintuitively) smaller DVP4. [NAMM] [VIDEO] Marshall 2525C Mini Jubilee A live demo of Marshall's new 2525C Mini Jubilee combo from their booth at the NAMM. [NAMM] Supro resurrects the Black Magick Supro recreates one of the most legendary amp models in the history of rock&roll: the Black Magick.